Wired2Learn Academy was featured in the CDA press on March 18th. Here’s the original story, reproduced below. 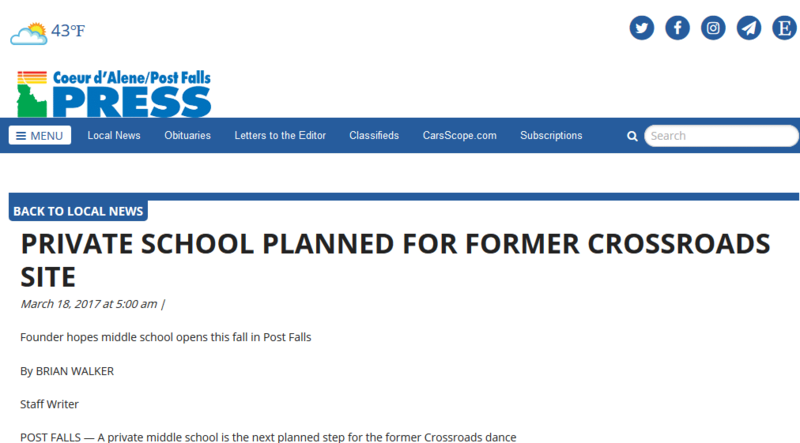 POST FALLS — A private middle school is the next planned step for the former Crossroads dance studio on Highway 41. Alyssa Pukkila purchased the property and is planning to open Wired 2 Learn Academy this fall with up to 36 students. “The school will offer a unique environment focused on collaboration and communication in which teachers will act as learning coaches for students’ growth in critical-thinking and problem-solving skills,” Pukkila said. She said learning will be project-based rather than in a traditional classroom setting. Students will not be separated by grade. Pukkila, who has a master’s degree in psychology, said she has spent more than 10 years studying neuroscience, cognitive science and psychology to understand how the brain learns best. She said the sense of belonging and having joy are critical to improved intelligence. “Our goal will be to create a loving environment that will allow every student to belong, to be the best he or she can be and to be the most creative that he or she can be,” she said. Pukkila said the school will be open to students who have a wide range of learning abilities. Pukkila said she envisions the school having three learning coaches for the school to start. Pukkila said the tuition to attend the school has not been determined. She said a foundation will be established to assist those in need with scholarships. Pukkila said the school will be similar to the Anne Frank Inspire Academy in San Antonio, Texas. For more information, visit www.wired2learnacademy.com or email apukkila@wired2learn.org.